Hi! This is placement or final test for 4 year students. There you will find correction the mistakes, prepositions of place, orders, word order in present simple, present continuous, some and any, personal pronouns, 3 forms of the verb (present, continuous, past). 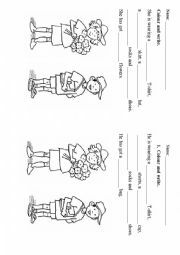 this test contains tasks for articles a/an, numbers, letters, and plurals. I used this test for my 1st form (grade) pupils. I think you can try it for 1st or 2nd year pupils (as placement test or general test). Hope, you´ll find it useful. 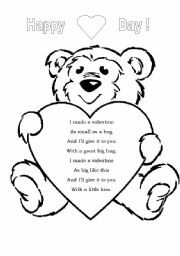 I used this song with children of 7. But it is also suitable for children about 5 years old. After the song we coloured the pictures and gave them as a present for the parents. There is a video for this song but you can sing this song without music. 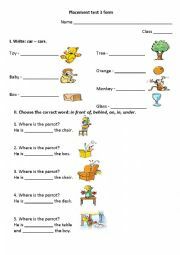 This worksheet can be used as a pair work activity. You need to download at least one more worksheet. Student A reads the text about Celine Dion. Student B reads the text about Milla Jovovich. Then they need the ask questions to fill in the gaps. They also can use Past Simple questions. 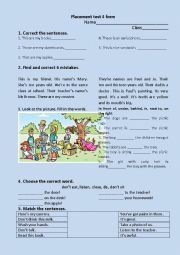 Don´t forget to cut the worksheets in halves! 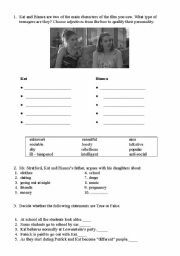 This is the second part of the movie worksheet. It helps to work with vocabulary (adjectives). Also it contains the lyrics of the song from the film. Enjoy! P.S. Don´t forget to download the first part. This presentation has the following phrasal verbs: look, make, take, give. At the end your students can create their own comic with phrasal verbs.